Perilla is a brilliant herb. Incredibly beautiful, with purple undersides, it's a robust leaf and it has an incredible fragrance to it. A little anise, a hint of mint, slightly medicinal, it is used across Vietnamese, Korean and Japanese cooking. It is very similar to shiso - I would find it difficult to tell the difference in a flavour test. In London, you can buy huge bunches of the stuff cheaply at Longdan in Elephant and Castle - they also have other branches. 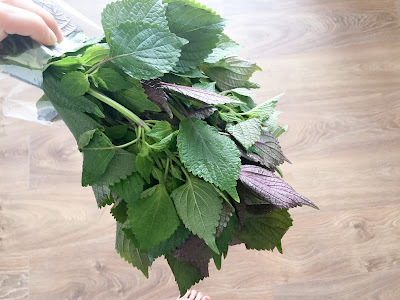 You can buy shiso leaves at The Japan Centre, but here they're not cheap at all. I bought this particular bunch for the Bun Rieu, and I was left with a huge bunch of the rest. So what to do? This kind of pasta, called 'wafu', is based on Japanese fusion. It takes European ingredients and fusions it with Japanese flavours. 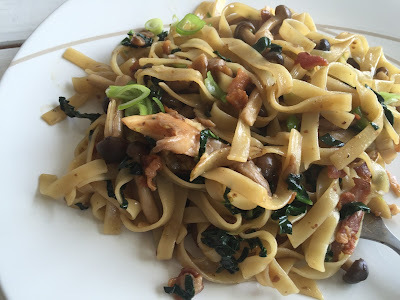 Here, I used tagliatelle and a rich butter and miso sauce to dress the pasta in. Exotic mushrooms like shimeji and brown beech mushrooms are bolstered with oyster mushrooms too. I loved this; the butter gives it a luxurious richness, and when mixed with soy sauce and miso, it really adds a whole lot of umami to those mushrooms. Shredded perilla give it an extra citrus-like freshness. Put the pasta on to cook in heavily salted water. Melt the butter and mix in the white miso and soy sauce until completely incorporated In a cast iron pan, add the oil and heat on high until smoking. Add the oyster mushrooms and sear for a few moments before moving them around the pan. Add the clove of garlic and stir continuously so the garlic doesn't catch. Add the shimeji and brown beech mushrooms, cook for another minute, and then add the butter miso and soy mixture, taking it off the heat as you mix it in. 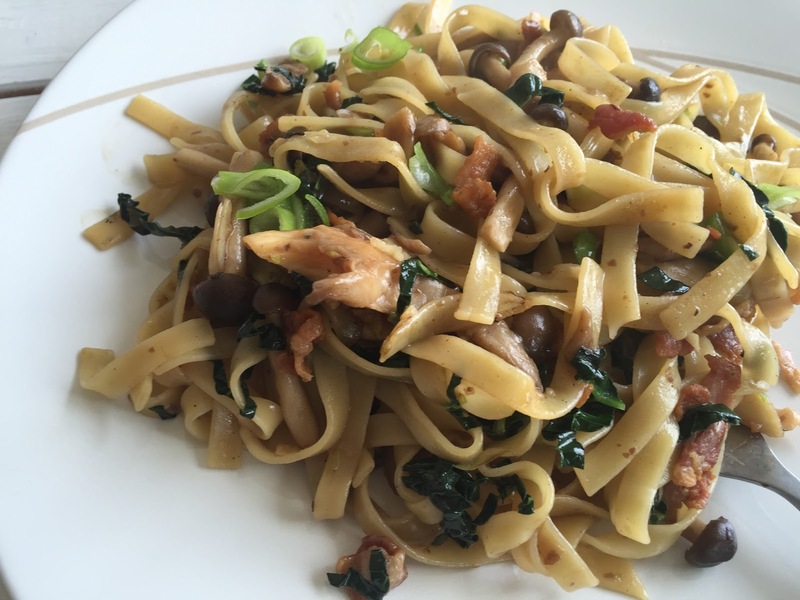 For the final minute, add the cavalo nero to the pasta cooking water, then drain, reserving 4 tbsp of the cooking water. 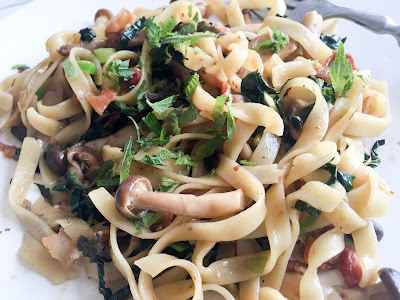 Add the tagliatelle to the mushroom mixture and mix well, with a little of the reserved cooking water. Serve, and garnish with the spring onion and perilla leaves. Oh this looks lovely! Great to know about the shop in E&C too. Very nice! I must try this. I've seen Perilla growing like a weed in the US but not seen much of it here though.